Importer: Hewlett-Packard Co., of Palo Alto, Calif. 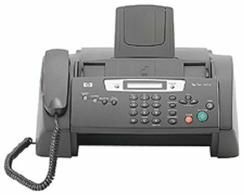 Hazard: The fax machines can overheat due to an internal electrical component failure, posing fire and burn hazards. Incidents/Injuries: Hewlett-Packard is aware of seven reports of fax machines overheating and catching fire, resulting in property damage, including one instance of significant property damage and one instance of a minor burn injury to a consumer’s finger. Six incidents were reported in the U.S. and one in Canada. Description: This recall involves HP Fax 1040 and 1050 models. The HP logo and the model number are printed on the front of the fax machine. The fax machines are dark gray and measure about 11 inches high x 14 1/2 inches wide. Sold at: Electronics, computer and camera stores nationwide, and online at www.shopping.hp.com and other websites from November 2004 through December 2011 for between $90 and $120. Some of the recalled fax machines were replacement units for a previous recall involving HP fax model 1010 in June 2008. Remedy: Consumers should immediately stop using the recalled fax machines, disconnect them from the electrical outlet and contact HP for a rebate on the purchase of an authorized replacement HP fax machine or a partial rebate of certain HP ink jet printers.